To continue our discussion of the psychology of repetition, we must acknowledge that repetition is at work before we even recognize the subject of an image. Let’s consider something that happens subconsciously in the first second we look at a painting or drawing. We notice the frame. Remember that our eyes are always scanning imagery looking for something familiar, something we recognize. The very first thing we comprehend is the shape of the frame. Look at the square below. The right angles of the corners are distinguishing features and familiar. The repetition of right angles draws us from one to the next. In a fraction of a second our eyes take in all four corners. In the sweep from one to the next we notice the sides of the frame that connect them: two verticals and two horizontals. The sides being of equal length, we recognize the shape as a square. The arrows represent the probable paths that our eyes take as they scan the image. What do you suppose happens where paths cross or meet? Such intersections create focal points. Now look at the rectangles below. These are traditional shapes for compositions. The vertically oriented rectangle is usually used for portraiture. The horizontal one is commonly used for everything else: landscape, still life, and narrative depictions. The horizontal rectangle sends our eyes scanning in a lateral motion. The vertical one tends to draw our attention from the top to the bottom. Here’s where it gets interesting. Our brains are able to look at an image with both an environmental and a retinal orientation to the picture plane. These are terms used by Rudolf Arnheim in his classic, Art and Visual Perception: A Psychology of the Creative Eye. Specifically, with an environmental orientation one reads gravity into the pictorial space as if the picture plane were a picture window. With retinal orientation one perceives the flatness of the picture plane as if it were the frame around a table top, where there is no top nor bottom. As we consider the rectangle, our environmental perception usually leads us from the upper regions to the lower. When combined with our western perceptual tendency to read the picture plane from left to right, our eyes follow a diagonal path from upper left to lower right, unless focal points in the composition deter our eyes from this path, as the rectangles on the above right illustrate. Next time we will learn why it is important for artists to be intentional about the shape and orientation of their compositions. Our eyes naturally scan as we look. In fact, it is difficult to hold our eyes in one position. They immediately tire (it’s called retina fatigue) and return to scanning. Another reason that the eyes continuously scan is that they search for fields of recognition. Upon recognition, the eyes continue to scan looking for more of the same. This is the perceptual basis for the compositional strategy we call repetition. It is important to note that repetition isn’t simply pleasing. It sets the eye in motion from one familiar focal point to the next. 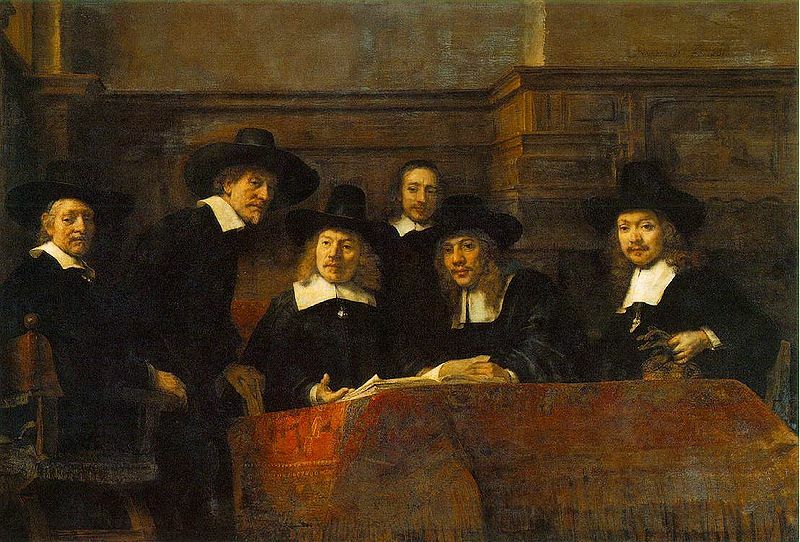 Notice what your eyes are doing as they take in the Rembrandt painting below. What do you notice first? Where do your eyes take you next? And then where? After scanning the image from left to right, hovering over the light angular shapes of the collars, my eyes then land on the gentleman who is third from the left. Is this how the composition operates for you, too? I'll write about why this is so in Part 2 of this blog. Suffice it to say for now, however subconsciously it occurs, our eyes begin looking at this painting with a lateral scan from left to right, guided largely by the perceptual tendency to follow the path of repeated conspicuous shapes--repetition. For those of you who are still unfamiliar with this compositional principle, simply equate it with visually "connecting the dots." Let's continue to use my six-step ©Follow Your Eyes Method in order to see what these artists were really up to. 3. Follow Your Eyes to identify the focal points along the visual path over the surface of the picture plane. As you can see from the diagram of the Caravaggio painting below left, our eyes begin their path with the fully lit up-turned face (1) of the woman in the upper right corner. Her face is flanked by her wing-like open arms with fingers spread wide. The repetition of oval face shapes draws us to the Mother Mary (2), her down-turned face encircled by her white headdress. We follow the direction in which Mary looks to her outstretched hand appearing from behind the faces of the men (3) carrying Christ’s body. The men look downward and we follow their gaze to the face of Jesus (4). The intense value contrast between Christ’s arm and shroud against the dark background imply a line dropping downward to Christ’s hand grazing the tomb’s stone slab (5). Here at the bottom of the picture plane, our eyes are virtually halted by the chiaroscuro (literally light-shadow) of the stone’s vertical edge. But the repetition of arcs in Christ’s arm, the shroud cradling his hip, and the profile of feet and ankles (6) sweeps our eyes upward to the right to the feet of Jesus. The focal points in Van der Weyden’s panel are densely packed groups of objects. In this strongly symmetrical composition it is not surprising to find our eyes begin to focus on the center of the painting where the stem of the cross meets Christ’s body (1). From here we follow the light shape of the body to the center right where hands carry his feet (2). The arc of the body continues through the feet along the red sleeve and shoulders of the woman on the far right. Her face and that of two others form a focal group (3). Their heads are aligned with the horizontal band in the gold backdrop which guides our eyes leftward following the direction in which the group faces. Traversing the panel past our initial focal point we arrive at another focal group, the three faces on the far left (4). The figures gesture downward to support the Mother Mary (5), whose arm hangs limp among yet another focal group: a skull, Mary’s hand, and a man’s bare foot (6). The objects form an implied diagonal that points our attention to Mary’s other hand, dangling and almost touching the pierced hand of her son (7). 4. Note focal points, if any, that lead your eye on a path back into the illusory space. Space is often a metaphor for time. The lack of space might indicate a momentary or immediate event. Neither of these paintings depicts a deep space. Both scenes take place in the foreground in close proximity to the viewer, suggesting an event happening in the present. The figures are barely contained by the picture plane and because these paintings are large and have quite similar dimensions the figures appear nearly life-size. 5. Identify the two visual paths and interpret their configuration, as well as information revealed at the focal points. We need only identify the visual paths over the surface of the picture plane as these paintings have no middle ground or background. Caravaggio’s Deposition has a visual path of descent from right to left, suggesting a part of the story that is not literally depicted by a cross. Even though the space is shallow, his visual path alludes to the immediate past event of taking the body down from the cross and the struggle involved in it. What we see depicted in the present is the lowering of Christ’s body into the tomb as indicated by the dark recess below the stone slab. Unexpectedly, the visual path does not end here but follows an upward arc to the right. Movement to the right flows more naturally and even though we might sense some strain in the upward nature of it, we sense momentum behind it as if our eyes follow a swinging pendulum. Is the fulcrum of it Christ’s hip or the elbow that protrudes directly toward us in the center of the picture? What could Caravaggio be saying here? Not only has he alluded to the past, painted the present, but he has also suggested the future. The upswing of his visual path alerts us to the imminent resurrection of the body. Even though Caravaggio did not depict the cross it is embedded in the composition. Although secondary to the oval shape of the visual path, a cross is formed by a horizontal line implied by Mary’s outstretched hand, the heads of the men, the man’s protruding elbow, and the horizontal shadow of his cloak leading to Mary’s other out-stretched hand. This horizontal line is intersected by a vertical line implied by the vertical edge of the tomb stone, Christ’s wrapped hip, the head above it, Mary’s face, and the hand above her head. The suggested cross aids the viewer’s identification of the main figure as Christ Jesus. Van der Weyden’s Descent has a visual path that descends from the top center, turns right and then back to the left crossing itself to the far left, ending in descent. Trace the path with your hand. I did, and as I did I had this odd feeling and thought to myself, "Doesn't it remind me of a gesture I have seen people make with the hand?" It reminds me of the path one makes across the heart in the Christian tradition of “making the sign of the cross” or “crossing oneself” for protection or in prayer. The descent from focal group (4) to Mother Mary in blue is the tail end of our visual path, but not diminished by its location outside of the implied cross. In fact, we are drawn to three focal areas on Mary, which create a secondary path in the composition. First we see Mary’s face with her eyes shut and the pallor of her skin more ashen than any other including Jesus. Has her grief killed her? We follow her arm down to her hand and the skull (6), another allusion to death. Finally, our eyes rest on her other hand forming a focal group with the hand of her son (7) suggesting they have joined hands in death. It seems that Van der Weyden intended to make a painting about the pain of grief, mortality, and death. The T shaped cross at the top of the long horizontal format acts like a plunger, pushing downward as if to compact and intensify the pain of death among those bound to this earth plane. Our eyes make the sign of the cross, a subconscious sacred gesture, as we witness the tragedy before us. 6. Check your interpretation against your initial impression. Your interpretation will be an expanded and deeper version of your original impression. Though we knew both paintings depicted the same subject and evoked feelings of grief, we now see clearly how different compositional approaches led us to different conclusions about death. While Van der Weyden’s composition seems to be about Mary and the devastation of her grief, Caravaggio’s composition suggests flight and the hope of resurrection. Now that we’re familiar with the six-step process of the ©Follow Your Eyes Method, let’s use it to compare two famous paintings with the same subject. In these two paintings the artists are depicting a scene following the crucifixion of Christ. It is commonly referred to as the Deposition or Lamentation and is the 13th Station of the Cross. 1. Note your first impression of the image in terms of an idea or a feeling. These paintings are about death and grief. The Caravaggio painting has the feeling of flight, whereas the Van der Weyden feels congested and densely packed. 2. Note the orientation and shape of the picture plane. Caravaggio composed his subject in a vertical rectangle emphasizing vertical movement. Our eyes travel from the upper right in an arc following the repeated pattern of heads and outstretched hands down to the lower left of the picture plane. 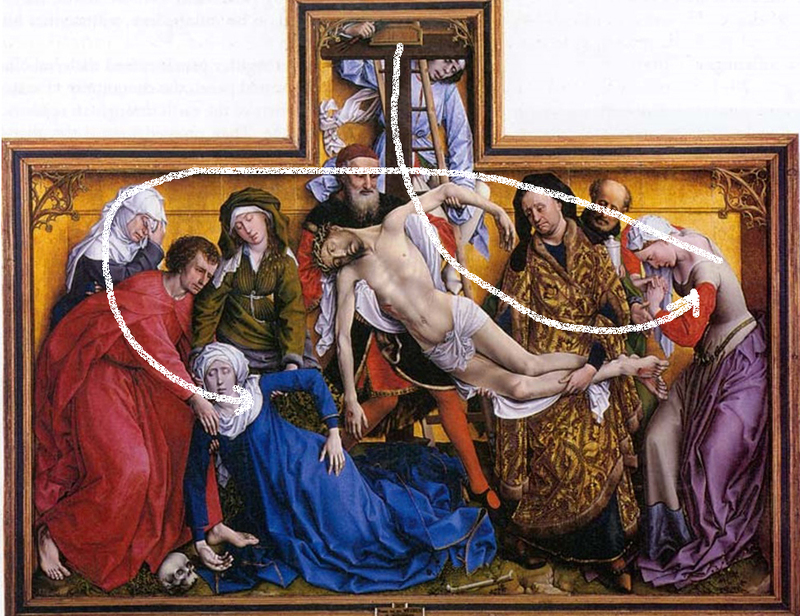 Van der Weyden composed his painting in a horizontal rectangle emphasizing lateral movement. His panel has an inverted T shape, which is mirrored in the upright T shape of the cross that breaks the upper frame in the center. Our eyes start at the top center in this irregular protrusion and drop into the inverted T via the stem of the cross and ladder angling to the right. Here we begin to follow the repeated pattern of heads from right to left. Although these two compositions differ in orientation it is pretty interesting to note that they both use right-to-left movement, which is contrary to our perceptual tendency to read images from left-to-right. They “go against the tide,” so to speak, and thereby effectively create the sensation of struggle. A Look at David’s "Death of Marat"
I developed a six-step method, the Follow Your Eyes Method, for analyzing composition that is accurate and easy to use. Follow along below. An analysis of the Death of Marat painted by Jacques-Louis David in 1793. Oil on canvas, 65” x 50.5”, Musees Royaux des Beaux-Arts de Belgique, Brussels. 1. Note your first impression of the image in terms of an idea or feeling. The artist has chosen a vertical rectangle, which causes the eye to move in a predominantly vertical direction. In this case my eye follows the light, which spills into the interior scene from the upper left down into the lower right. The final illuminated crate in the lower right corner of the picture repeats the shape of the picture plane thereby reinforcing the downward direction of the overall movement. As noted above, my eye follows the light spilling into the scene and arrives at the text, À MARAT, DAVID, (1) which by its very nature gets our attention and invites reading, “to Marat, David.” Perhaps the light vertical edges of the crate seen against the dark shadows reinforce the dramatic plunge to the floor. Conspicuously illuminated among the darkest shadows left of the crate is the small, vertical, and slightly curved body of a quill pen (2), which points downward and is barely in the grasp of Marat’s hand. The point of Marat’s pen is intersected by the bottom edge of the sheet. The edge creates a slight lateral movement, a detour if you will, to the slim, ivory handle of the murder weapon, a knife, (2a) on the floor to the left. The curve of Marat’s arm draws my eye in an arc upward, which is paralleled by the deeply shadowed vertical folds in the sheet, one of which falls in line with that of the dripping blood, leading my eye up Marat’s chest to the puncture wound just below his clavicle near his shoulder and on to his face (3). In the case of figurative art, we tend to seek out the faces of figures, because these are the configurations of shapes that we instantly recognize and have had the most meaning for us since birth. My eye then follows the strong value contrast between the dark background and the light skin of Marat’s arm across to the brightly illuminated letter (4) still in the grasp of his hand. Again, because of the power of recognition, my eye then notices the similar but smaller hand-written notes, inkwell, and quill pen atop the crate just below the letter (4a). 4. Note focal points, if any, that lead your eye on a path back into the illusory space. The entire scene exists in the shallow space of foreground. The lack of deep space in this composition suggests the immediacy of this event. The murder has taken place only moments ago, as indicated by the letter and pen still in Marat’s grasp. 5. Identify the visual path and interpret the configuration, as well as information revealed at the focal points. My eyes made an initial downward arc to the bottom-right of the picture plane. It would be very easy to stop right there, had David not created three more very strong focal points: Marat’s hand-held pen (2), head (3), and hand-held letter (4). These focal areas create a visual path in the shape of an inverted irregular triangle, which is very unstable. It is dynamic, to be sure, and balances precariously on its bottom point. Our interpretation? David intended to convey that Marat’s life and his death rested precariously on the point of his pen. The extreme downward motion of the composition relates to Marat’s sudden fall—his death—and the finality of it. 6. Check your interpretation against your initial impression. As you can see, my initial interpretation has not changed, but has been deepened by considering the compositional strategies David employed to tell us something meaningful about Marat. ONE: Note your first impression of the image in terms of an idea or a feeling. Try completing the sentence: This painting is about _____________(examples: suffering, humility, death, innocence, war, peace, love, hope, joy, etc.). If the artist is a master of composition, your impression should be correct. TWO: Note the orientation and shape of the picture plane. (Is it a vertical or horizontal rectangle, oval, circle, or square?) They will determine the overall direction in which your eyes travel. THREE: Follow Your Eyes to identify the focal points along the visual path over the surface of the picture plane. Note that your eyes follow implied lines created by value or color contrast, repeated shapes, the direction of the light, and the direction in which figures gesture or look. Focal points are created by detail, the intersection of implied lines, text, faces, and contrasting values or colors. This is called the planar composition. FOUR: Note focal points, if any, that lead your eye on a visual path back into the illusory space. This is called the spatial composition. Space is often a metaphor for time. The lack of space might indicate a momentary or immediate event. FIVE: Identify the two visual paths and interpret their configuration, as well as information revealed at the focal points. Diagramming each path makes clear the configuration or the shapes that the visual paths create. Note that diagramming the spatial composition might require an aerial view. SIX: Check your interpretation against your initial impression. Your interpretation will be an expanded and deeper version of your original impression. The depth of your observations directly coorelates to the degree to which you will have "cracked the code." In the posts to come I will explain each of these steps in detail. Happy decoding! Copyright Melissa Weinman. All rights reserved. I have always begun my lectures saying that art is a visual language—a very powerful language because it is the language of the subconscious mind. I am here to explore the connection between art and our inner world. Why? Because our inner world is a wealth of wisdom that can help us physically, emotionally, and spiritually. This amazing non-verbal language reaches us in the territory of our subconscious even when our reasoning left-brain doesn’t understand. Have you ever wondered what makes a work of art a masterpiece? Why do you think some works of art endure and we lose interest in others? I think it is because the non-verbal message in these works of art is relevant and lasting. The artists who created them were masters of visual language, wielding images as deftly as poets wield words. These artists understood the way in which the subconscious mind perceives and structured their pictures accordingly. Perhaps this is why images capture our imaginations and draw us in as if solving a puzzle or cracking code. I am using this blog to perform the task of helping others to use and understand art as a point of entry into our inner worlds where that wisdom can meet us and transform us. Works of art can use the power of suggestion to tease us into filling in the blanks with our own impressions making them real to us. They can depict extraordinary things that make us wonder. In the same way that verbal language hints at themes and ideas through its forms, so does the visual language. In the following blogs you will learn about the forms of the visual language and how to read them. You will learn to look past the subjects of a painting into the arrangement of them. It is here, in the arrangement that you will uncover the code embedded in it. And with a little imagination, you will learn how to create the codes that hold the meaning to your own paintings. Melissa Weinman is both accomplished painter and professor. Twenty years in the studio and university classroom have shaped her ideas about looking at and making art. Her knowledge of art comes first hand, gleaned from experiences with art in American and European collections, in her practice of making figurative narrative paintings, and in teaching others how to give meaning to their own creative expressions.